This lesson took several steps to create. First, you were to sit with yourself quietly and feel what you were experiencing at that moment within your body. You were to then journal your sensations and emotions on the page. By doing this, you acknowledge those feelings (even if they are negative) by doing this, you give them freedom to release. Next, you may take some breaths and just relax and feel what it is to be in that space as well. All the while taking moments to journal this to your page. The figure you draw is a representation of your feelings of well being and you were to choose an animal to be the gardian of your feelings. The background is whimsical and fun (I would say this is true to Tamara’s artistic style). While I believe recognizing and honoring feelings is vital, creating the guardian was my favorite part of the lesson. Imagining a protecting and comforting presence will remind the journaler long after the page is put away that we have sources of love surrounding us ready for us to beckon. 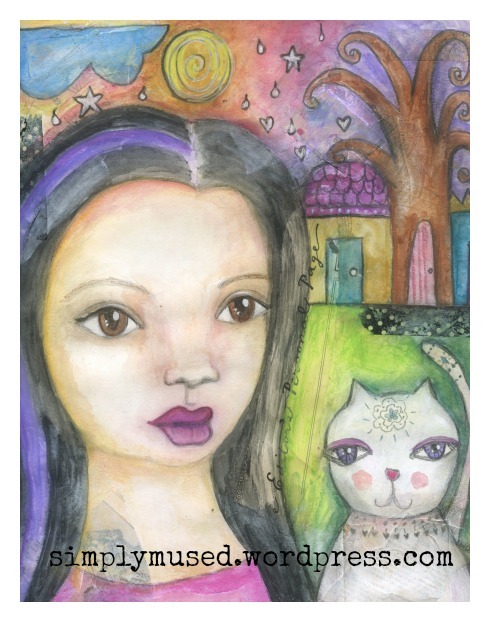 This entry was posted in Lifebook Projects and tagged art journaling, creativity, honoring feelings, Lifebook. Bookmark the permalink. Simply beautiful with a touch of whimsy.. I love it. I cannot decide which I like best, the exercise or the outcome. Both are excellent. Thanks so much for stopping by my blog and alerting me about yours! It feels very synchronistic to me, affirming my increased interest in trying new media for expression, and reminding me, not only of how much I got from The Artist’s Way, but how many practices from it have become an organic part of my life! This blog seems like a great gift, for you to chart your journey, and for the rest of us to be inspired and learn. So, thank you for sharing!